Joanna Schiaffo - New Jersey - Book a consultation instantly! In 2009, I began my legal career at Rutgers University Camden where, after the first year, I primarily took courses in family law. While at law school, I co-founded the Family Law Society and participated in the Domestic Violence Clinic. Subsequently, I clerked for Monmouth County Superior Court Judge John R. Tassini, J.S.C. During my clerkship, I was witness to hundreds of post-judgment matrimoinial actions, as well as actions involving the Division of Child Protection and Permanency (formerly known as DYFS). Following my clerkship, I was an associate at the Law Office of DeNoia & Tambasco, LLC where I handled matrimonial and municipal court cases. 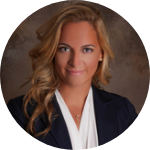 I am currently an associate at the Law Office of Rachel S. Cotrino, LLC where I specialize in matrimonial matters, inclusive of divorce, post-divorce enforcement and/or modification applications, and domestic violence. I have always had a passion for family law and pride myself on promptly returning client's phone calls and emails. I look forward to serving you.